Learning Goal: On a map locate and label the countries involved in WWII. Bellwork: Who were the 3 major countries in the Axis Powers? Who were the 3 major countries in the Allied Powers? Students were given a map of the European Theater and the Pacific Theater. Students were to locate and label the countries involved in WWII. This is a graded assignment and due on Monday, April 10th. Learning Goal: Explain how different forms of government can sometimes led countries to go to war. Bellwork: What form of government does the United States have? Students were told that 2 Orange Grove students won the state championship in Personal Finance Case Study division. Students saw a timeline of WWII and learned about the different forms of government that were around during WWII. We had a class discussion how the types of governments might lead to war. Learning Goal: Describe in background and impact of the WWII leaders. Bellwork: List 3 WWII leaders. Students had their graded WWII maps returned. Today students leader about the political leaders of WWII. Learning Goal: Describe the background of WWII leaders. Explain the history of the Holocaust. Bellwork: List 3 things that Hilter, FDR and Churchill have in common. Students finished their notes on WWII leaders. Students watched a video clip on why to studied the Holocaust. Students read "The Final Solution". Learning Goal: Explain the history of the Holocaust. Bellwork: Write down 2 questions you would like to know about the Holocaust. Students wrote down questions about the Holocaust we will try and answer them as we learn in the next few days. Today students read about "The Final Solution" from the textbook. Bellwork: What is pseudo science? How did the Nazis use it? Students read a handout on the History of the Holocaust. It covered the beginning of the abuse of the Jewish people with the Nuremberg Law, then the Concentration Camps and where they were located. Students filled out a notetaker. Learning Goal: Explain the history of the Holocaust. Explain the Battle of Britain. Bellwork: Reviewed the answers on the graphic organizer given to students on Friday about the History of the Holocaust. Students begin learning about the Battle of Britain or what Churchill called The Blitz. Learning Goal: Explain the events of Pearl Harbor. Bellwork: After the Nazis defeated France they turned their attention to what country and what was the name of the battle? Students learned about the attack of the United States by the Empire of Japan at Pearl Harbor on December 7, 1941. Learning Goal: Describe how America prepared for WWII. Bellwork: What day was Pearl Harbor bombed and what were the results of the attack? 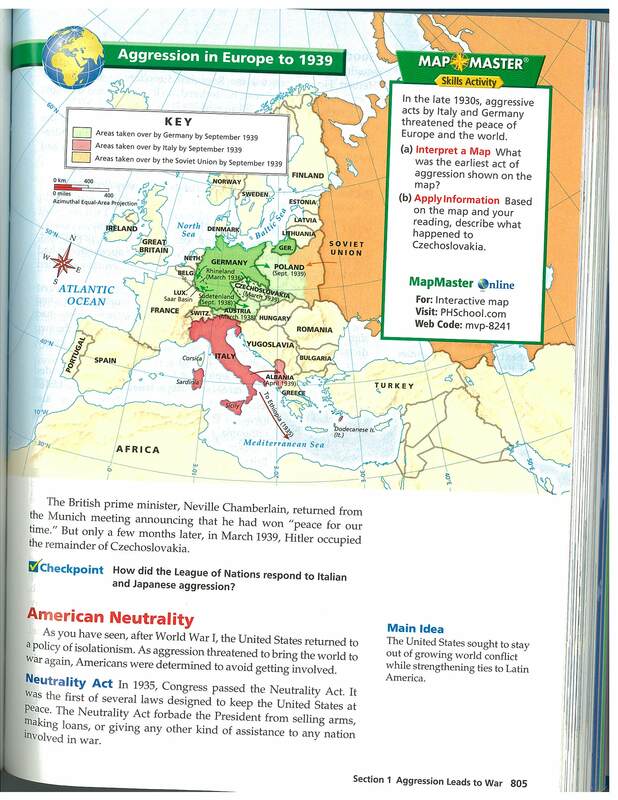 ​Students read in the textbook how America prepared for WWII. Learning Goal: Create a plan to invade Europe. Students were divided into groups of four and given the task to develop a plan to invade Europe. Today the students became familiar with the fields; they will become an expert in location, weather, strategies or commander of their group. Bellwork: What is an amphibious landing? Students worked in their expert groups working to become smart on their area; strategy, weather, or location. Students were told they will have a pop quiz on Monday. There will be ten multiple choice questions on the material attached below. Bellwork: Who is the commander of Operation Overlord? Students took a 10 question pop quiz on the graphic organizer "America's Road to War". Students continued to work in their groups to develop a plan to invade Europe. Bellwork: What did U.S. citizens do to support the war effort? Learning Goal: Present a battle plan to invade Europe and crush the Nazis. Bellwork: What is the name of the symbol of women working for the war effort? Students presented their groups' battle plan for invading Europe and defeating the Nazis. Learning Goal: Describe America's role in the war in Europe. Bellwork: What foreign policy did America have when war broke out in Europe in 1939? 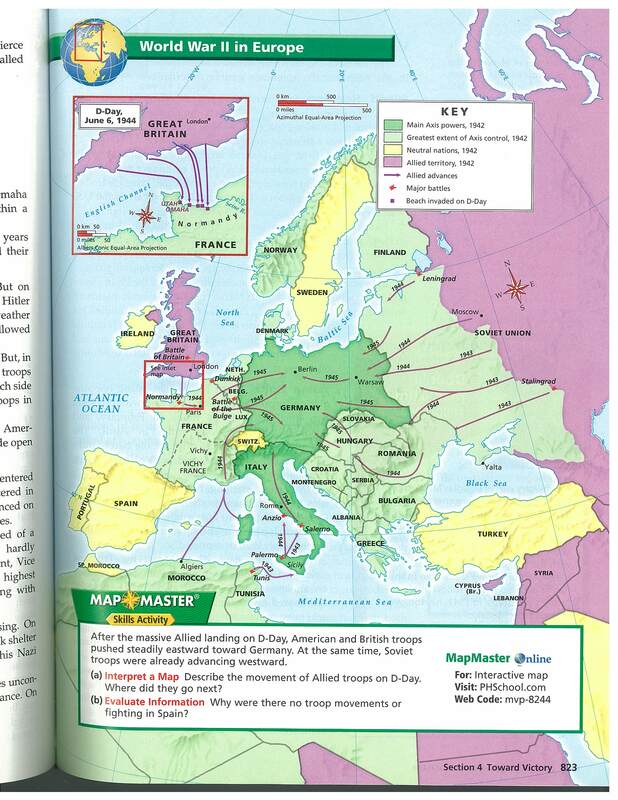 Students read in the textbook about the war in Europe and filled in a notetaker. Learning Goal: Explain the importance of the Tuskegee Airmen. Describe the Japanese internment camps. Bellwork: What type of government did Italy and Germany have during WWII? Students learned about the African American fighting group - the Tuskegee Airmen. Students learned about their training, the combat record and their impact on the future civil rights movement. Students read about America's reaction to the bombings of Pearl Harbor and war with Japan. the Japanese internment camps in the US. Students watched a video clip of first hand accounts about the camps. There will be a World War II quiz on Tuesday, May 9th. The Study Guide was handed out in class, attached to this lesson and is under Homework. Learning Goal: Discuss the main events of the Pacific Theater. Bellwork: Where can the most concentration camps be found? Students reading about the Japanese Internment camps then watched a short video on the topic. 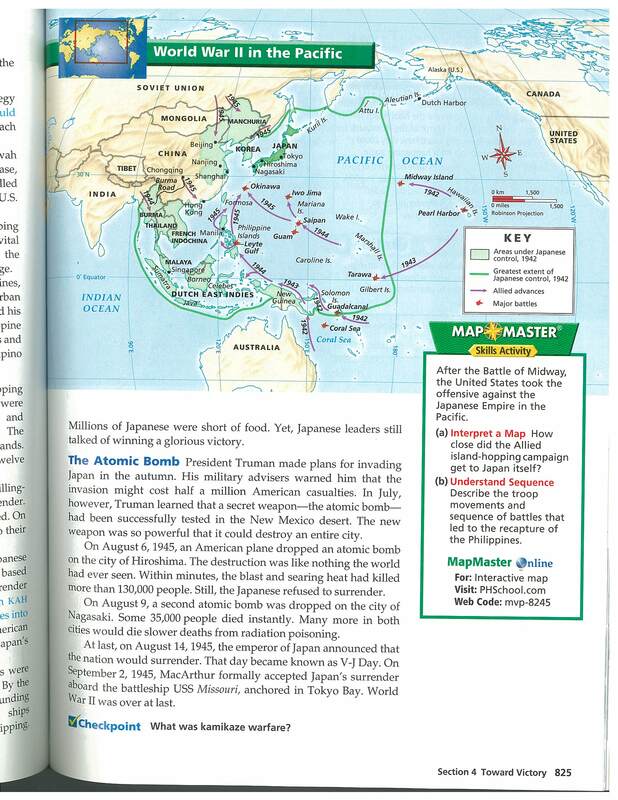 Students then read in the textbook about the war in the Pacific Theater. Learning Goal: Make a claim and support it. Bellwork: Was Hitler was the only leader during the WWII era that chose to isolate a specific ethnic group? Students finished filling in their graphic organizer on The Pacific Theater. Students were given the choice of 3 prompts to write about specific events about WWII. They were to write a paragraph on the topic (topic sentence, 3 pieces of support evidence that are explained and a conclusion). The paragraph was handwritten and turned in during class. 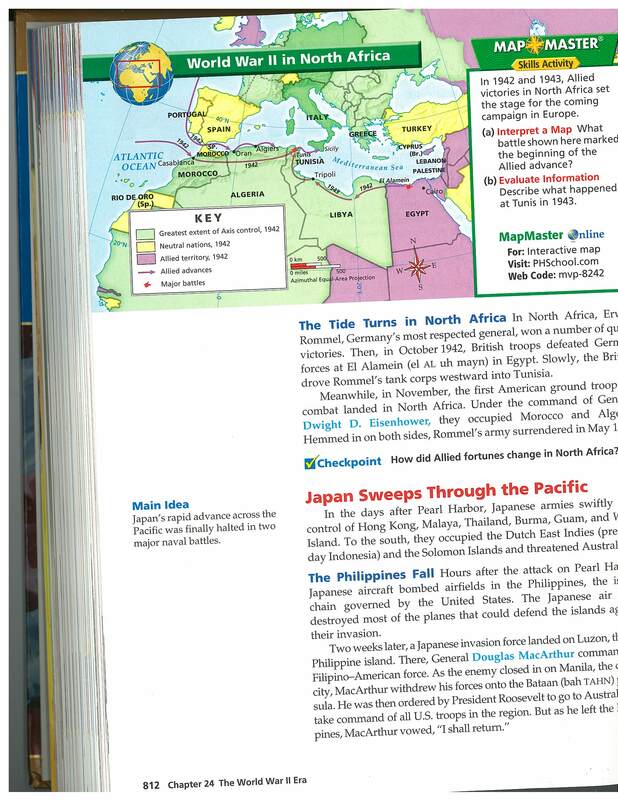 Students were able to use any notes they had and the textbook to support their work. Learning Goal: Explain the role of the Navajo Code Talkers played in WWII. Bellwork: What was the Lend Lease Act? Students finished filling in the graphic organizer on The Pacific Theater. Students read an article from the National Museum of the American Indian (the Smithsonian Institute) about the Navajo Code Talkers, watched a short video and looked on the Code Talkers dictionary. Learning Goal: Assess the decision to drop the atomic bombs. Bellwork: Which city was attacked with the first atomic bomb? Students began a journey on collecting information on whether they would have dropped the atomic bombs. Students read to textbook readings on the decision to drop the bombs and then watched 2 short video clips. Learning Goal: Review unit objectives. Bellwork: Write 1 sentence using 3 wordsplash vocabulary words. Students worked on their Study Guides, played Password and played Jeopardy in preparation of tomorrow's unit quiz on WWII. Learning Goal: Assess student knowledge of unit objectives. Bellwork: What countries are part of the Axis powers? Students took 15 minutes to review their notes then took a 30 multiple choice question quiz on the WWII learning objectives. Bellwork: Do you think we should have dropped the atomic bombs on Japan? Why or why not? Students were assigned a Pro or Con position to defend in a Fish Bowl. Students were given support information for their position and a notetaker to use to collect the information. Tomorrow will be the Fish Bowl debate. Learning Goal: Defend a position. Bellwork: What is your strongest argument? Students participated in a debate (Fish Bowl) on whether or not to drop atomic bombs on Japan to end WWII. Students were divided into Pro and Con for the debate and did research yesterday in class. Students had a notetaker they could take into the debate. They were graded for Critical Thinking and for Work Effort. Learning Goals: Describe what happened when the atomic bombs landed in Japan. Make a claim and support it. Bellwork: In a trial what the names of the 2 sides of a case? Learning Goal: Conduct research on your topic. Students conducted research today on their assigned role in the Truman Trial. Attorneys developed their questions for witnesses. The trial will begin on Thursday. Tomorrow jury members will begin to write their papers. Students continued to prep for their assigned role in the trial; conducting research, interview, reviewing courtroom procedures. Jury members prepared a 3 paragraph essay on whether or not the believed dropping the atomic bombs was right. This essay is due by 3pm on Friday. Tomorrow the 2 day trial begins and students are encouraged to "dress up". Learning Goal: Critically analyze then defend on a position on whether the atomic bombs should have been used. Students were assigned parts to a trial that charges President Truman with war crimes. This trial allows students to critically think about a historic event, develop a position then defend that position. Students will be given 3 grades for their work on this project. Learning Goal: Research colleges and career choices. Bellwork: Where do you want to go to college? Students researched on the internet possible career choices and college choices using links found on this website.